Aksys Games have announced two titles for the Code: Realize universe. 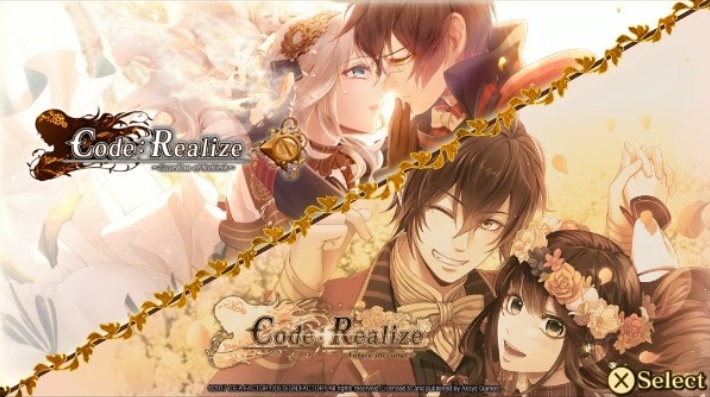 The first is Code: Realize ~Bouquet of Rainbows~, a collection of Otome adventures games featuring Code: Realize ~Guardian of Rebirth~ and Code: Realize ~Future Blessings~. This will be available for the PS4 releasing on March 30th, 2018 in North America and Spring 2018 for Europe. These titles are made by Idea Factory and Design Factory. The story stars Cardia, who first was isolated in a mansion in the 19th century of a steampunk London. She is cursed with a mysterious affliction where her blood is a deadly poison and touch instantly lethal. The second title is Code: Realize ~Future Blessings~, as a sole purchase on the PlayStation Vita. It is the second title in the series, building upon the first. Features include the ability to further relationships, new perspectives, and new suitors. Both titles also have a limited edition. Both limited editions will have a 17×24 cloth poster, set of nine 1.5” pins of the main characters, and eight bromides featuring the main heroes and heroine. Exclusive to the second title, however, is a special slipcover for both the first and second game. Two Games on a Single Disc – The PS4™ release of Code: Realize contains the first two games of the series: Code: Realize ~Guardian of Rebirth~ and the fan disc Code: Realize ~Future Blessings~ together in one place. The Romance(s) Continue! – Build relationships with dashing literary figures in the first game, and then delve deeper. Choose to strengthen the connection with your previous beau, or explore exciting new relationships with gentlemen you bypassed the first time. New Stories and Different Perspectives – Experience new scenarios taking place outside of the main stories as well as more in-depth looks at events that happened in the shadows of Cardia’s previous adventures. Code: Realize ~Bouquet of Rainbows~ Limited Edition for North America! Code: Realize ~Bouquet of Rainbows~ has been rated “T” for Teen by the Entertainment Software Ratings Board (ESRB). For more information, visit www.esrb.org.